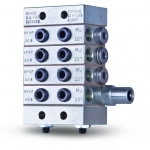 Trabon MJ divider valves from MotionSource are compact and customizable divider blocks for machine tool, product or press equipment. With a built-in outlet check valves to ensure accurate lube delivery every time, Trabon MJ divider valves are also space efficient. The ability for from 6 to 16 points from one block assembly makes it the perfect choice for tight spaces. A typical Trabon MJ divider valve assembly consists of an inlet section, end section and three to eight valve sections. One manifold will serve up to a maximum of 16 lube points. The MJ valve sections, which have built-in outlet check valves, are available in various output sizes. Each twin (T) section has 2 outlets, one from each side of the section. Each single (S) section can have an outlet on either side but the outlet on one side must be plugged for the section to operate properly. Order Today, Ship Today. Trabon MJ divider valves are in stock and available for same day shipping.